Being an allergy mom is hard and there is no user's manual! 1. I worry about my child's allergies and constantly have fear for his safety in the back of my mind. No REALLY, ALL OF THE TIME. At home, at the store, when we're out to eat, at family or friends' homes, when he's sound asleep, when he's swimming & bathing. I am ALWAYS worried about what could possibly cause a reaction to start. Our family and friends are AWESOME and really do try to keep him safe, but ultimately that responsibility falls on me. 2. I wish life were different, but I am doing my very best to make his life AWESOME and NORMAL. I refuse to force Vinnie (or our family) to live in a bubble. He is going to be a NORMAL little boy. I am not going to remove all allergens from our home, because I cannot possibly remove all allergens from the outside world and I need to teach Vinnie and Luke how to stay safe in the OUTSIDE world just as much as at home. We will go out & do things. We will go to parks that have trees with NUTS on them! We will go to amusement parks and we will eat in restaurants. 3. It may not make sense to you, but please don't think I'm over-reacting. This is what it takes to keep Vinnie safe. Yes, his allergies really are THAT bad. Please don't judge. You don't KNOW. Try walking a mile or a few days in my shoes and then we can talk about how I "over-react". 4. Food allergies can & often do, mean isolation for Vinnie. Please try to be considerate. This is the one I struggle with the most. It is so hard to see Vinnie get left out. It is difficult to provide snacks or other things so that he can just be one of the kids. I try, but its not easy. A little consideration from others and understanding goes a really long way. 5. It is not just a mild tummy-ache type reaction. The reactions are violent, involve multiple body systems, and can become fatal. For real. I have held my passed out child, limp, in my arms and watched him struggle to breathe. Until you have BEEN THERE, please do not down-play his reactions. Yes he has many intolerances and there are environmental factors which cause the minor symptoms of his excema to flare up, BUT, his TRUE IgE mediated allergies, can and will KILL him if we do not treat them properly and carefully. Vinnie has had many different symptoms because of his allergies, including vomiting and diarrhea, but even THOSE symptoms aren't considered "mild". Imagine the worst stomach bug or food poisoning you've ever had, couple with difficulty breathing, hives, and a sense of "impending doom". That's what it feels like when your food allergy is so bad you start to vomit. 6. Don't tell me that my child will, "grow out of it!" I don't know that & neither do you. Nor do I have time think that way right now. I've actually done some research into the matter and read different studies. Unfortunately for Vinnie, his allergies are SO bad, that he is actually NOT likely to outgrow them. It is very possible that he will NEVER enjoy the taste of real cheese or a real ice cream cone. He may never go a day without his Epi-Pen nearby. I especially don't want this to be said in FRONT of him or his brother. Don't give him that THING to look forward to, that may never come....because you'll be long gone when I have to break his heart that he HASN'T grown out of it. 7. Yes, a tiny little bit, WILL hurt. OMG. Seriously. Allergic=allergic. Most recently, Vinnie had a food challenge at the hospital. I baked cookies that were completely Vinnie friendly, except, I used REAL eggs instead of egg replacer. He had tested negative to baked egg (a different protein than non-baked egg) and his doctor thought he might be safe to eat it. There were 2 eggs used in the recipe that made about 4 dozen cookies. The cookies were about 5" across. The doctor broke off a piece of cookie that was about 1/4 of an inch round and offered it to him. Within less than 5 minutes, he had begun to break out in hives. Now, the amount of egg in that TINY bite of cookie, was incredibly small, but it still caused a full-blown allergic reaction. He received a shot of benadryl & 4 hours of observation in the hospital! Vinnie's first life-threatening food allergy reaction that sent us to the E.R. happened after he spilled an EMPTY cup on himself. The cup had been used for chocolate milk and had a tiny ring around the bottom, that trapped a few drops of milk. At the time, we didn't even know he had a dairy allergy--we thought it was from the corn syrup in the chocolate! Maybe 5-6 drops of chocolate milk spilled on his face. He did not DRINK any of it, but it managed to wipe into his mucous membranes. Within seconds of spilling the cup, he was breaking out in hives and hysterical. Another more recent occurrence happened during dinner at my parents' house. We were all having tacos. Vinnie was in his clean highchair with his safe cheese & some french fries. Tim fixed his own dinner and was eating with just one hand (or so he thought). Vinnie asked for more fries, which were on the main table. Tim used his "clean" hand to reach in the basket & give Vinnie some. Within minutes, Vinnie was having a full-blown reaction. We were able to get him cleaned up & dosed with benadryl & consult his doctor on the phone to avoid the hospital, but literally just the DUST/OIL residue from an offending food touching a food for a few brief seconds that Vinnie would then eat, caused a serious reaction. We do not take chances. Vinnie may not have ANY dairy, eggs, peanuts, tree-nuts, blueberries, cherries, bananas, peaches, corn, garlic, penicillin or cleocin. 8. Please make our lives easier by being aware that dropped food, wrappers, and uneaten-unattended food is extremely dangerous. You never know who is going to come along behind you. If Vinnie trips and falls on a floor that may be cross-contaminated he must immediately wash his hands with soap and water. He has tiny open cuts on his body from his excema and if your allergy prone food gets into those open sores (or any mucous membrane--via wiping his hands to eyes/mouth/or nose) he is then exposed and may react. Because he is a toddler and not fully capable of controlling himself or understanding his allergies, he still picks things up and wants to eat them! Your left-over pizza or candy could kill him. Please clean up after yourself & your children. That popcorn you spill on the ground & leave for the birds to clean up, it has sent my kid to the hospital. 9. This is NOT a dietary choice. It is MANDATORY. This is our life. I would not CHOOSE to limit our diet this way, if I didn't have to. We don't get to take a day off. If we run out of allergy-safe food, we have to buy or bake more. 10. This is not my fault. I am just a MOM doing my best to protect my kid from the dangerous world of allergens around us. I am NOT trying to inconvenience you. If you don't want to tolerate the things that we NEED to happen, say so and we'll take our business and our friendship elsewhere. I am doing my very best to keep my child safe, and sometimes, that means I need a little help from you. Instead of being put-off by my requests, or judging me, or thinking how HARD it will be to accommodate us, have a little patience, take a step back, and try to imagine just how HARD it is to be a 2 year old boy who can't have the things the other kids do, who can't eat the same snack as the other kids, who can't play with play-dough or eat real snow-creme while all his friends do. We aren't asking you to walk all day in our shoes, just change the way you do things for an hour or so, so that Vinnie, sweet awesome, fun loving, adorable, little Vinnie, can be a kid too. So, thanks to Rachel for getting that out there. 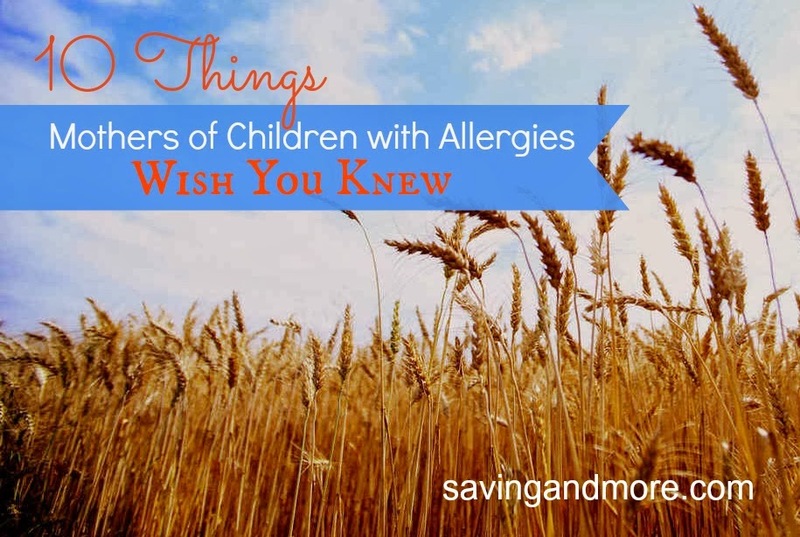 Now, I have one more thing I'd like to add, that THIS allergy mom wants you to know. 11. My kid is AWESOME. His allergies do not define him. He is smart and funny. He is tiny but fierce. He has a sense of humor. He loves to eat. His favorite thing is meat & gravy....to dip french fries in. He knows he is allergic to many things, but he still gets to enjoy candy and popsicles and pizza and all the other things that our family partakes in. He is a fighter. He deals with severe excema breakouts, hives, itchy and swollen eyes, hands, and feet on a regular basis....but he rarely complains. He is an awesome little dude and I love him just the way he is! If I could take away his allergies, I would, in a heartbeat, but I can't and I wouldn't change HIM for anything!